Hand-Tied Flies From Kenya – First Impressions | FISHING FURY - A Fishing Blog with Attitude! A few months ago I received an email from Kenya asking if I wanted to buy some handmade trout flies. Naturally I was very suspicious as Clive and I receive emails like this from all over the world, and typically the ones from Africa and China are simply scams, or some of the worst manufacturing you’ve ever seen. This email seemed different some how, so I decided to email them back and ask for some photos. It took a few days but they finally responded, the images were low quality and it was hard to envision these as quality flies but the person I was in contact with swore that they were 100% hand-made and would not disappoint. I thought about it for a while and decided to strike up a deal. They would send me some of their flies, and in exchange I would photograph them and review them. It took several weeks for my package to arrive from Kenya, but when I finally opened the package I was blown away with the quality. They call themselves the “Kenya Tyieng Flies Company” [sic] and if you’re interested in purchasing some of their flies you should contact Mr. Paul Mugo. Best of all these handmade flies only cost around $3-10 USD per dozen (depending on the type of course) plus shipping and handling. 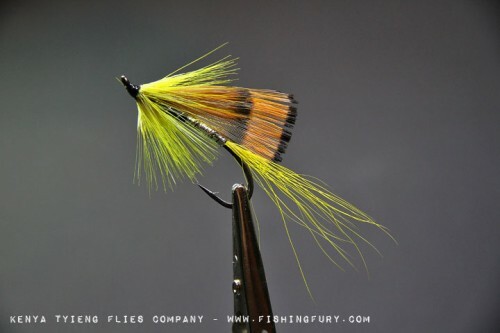 Considering the average rate around here is $2-6 PER FLY these flies are an amazing deal! Check out the full gallery for more great photos and if you’re interested in purchasing some for yourself, or for your business please contact Mr. Paul Mugo.